A myoepithelial hamartoma is a very uncommon submucosal tumor of the stomach. The exact pathogenesis and natural history of these lesions are not fully understood, possibly because very few cases have been reported in the literature. Gastrointestinal tract adenomyomas are generally considered to be benign and may present clinically with in part long-standing, but unspecific symptoms, such as pain, nausea, anorexia, and in some patients, they can cause intermittent pyloric obstruction. In an atypical presentation in our case, myoepithelial hamartoma mimicked the clinical presentation of a gastrointestinal stromal tumor. Hamartomas are relatively common in the gastrointestinal tract. It is also referred to as myoglandular hamartoma, adenomyomatous hamartoma, gastric adenomyoma, and heterotopia. Histologically, this tumor presents hypertrophic smooth muscle bands surrounding different epithelial elements that can be arranged in different ways: As a simple glandular structure, Brunner's gland, pancreatic ducts, and occasionally pancreatic acinus. Associated conditions may include annular pancreas, Gardner's syndrome with duodenal adenomas, and gastric duplication. The preponderant tissues that they contain are connective tissue derivatives including lamina propria, smooth muscle, vasoformative tissue, and nerve elements, though epithelial tissues also occur. Takahashi and Fukusato reported that these lesions demonstrated the presence of cytokeratin 7 on immunohistochemical staining, which is distributed in the pancreatic duct epithelium, suggesting that the heterotopic pancreas theory may be more plausible. The increased amount of smooth muscle in association with the lesions under consideration remains unexplained. In the stomach, the diffuse thickening of the pyloric muscle and excess of smooth muscle in the submucosa does not resemble any neoplasm of smooth muscle. Rare cases of ectopic pancreas and even fewer cases of gastric hamartomas have been reported in the literature. Autopsy findings of hamartomas were described in five cases for the first time in 1901; more recently, in 1993 was published a review of the literature comprising only 33 cases. The prevalence of Brunner's glands in the lesion, with the absence of exocrine pancreatic glands or Islets of Langerhans More Details (Askanazy, 1923; Delhougne, 1924; Lauche, 1924), was called by Stewart and Taylor (1925) adenomyoma. Clarke (1940) employed the term “myoepithelial hamartoma” to include “fully differentiated and incompletely differentiated aberrant pancreas,” adenomyoma, and any epithelial structure associated with an increased amount of smooth muscle in the alimentary tract. 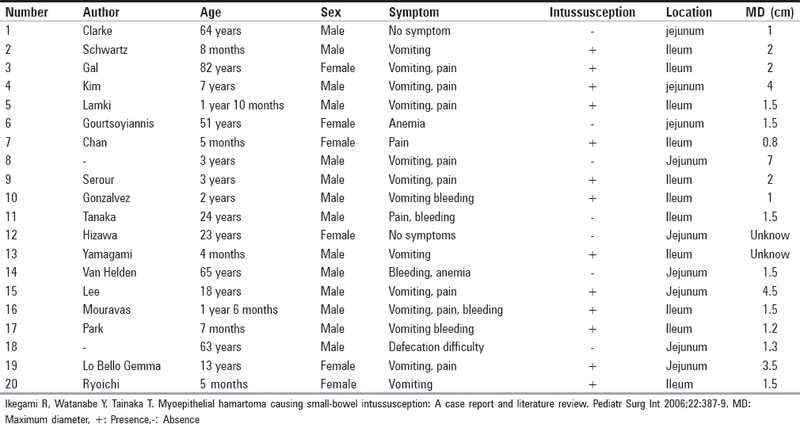 A myoepithelial hamartoma of the stomach is a very rare submucosal tumor [Table 1]. In particular, nests of ectopic pancreatic tissue without lesions have been detected in about a third of patients. The presence of Brunner's glands, together with pancreatic tissue, in the pyloric lesions is referred in standard works (Stout, 1953; Willis, 1958; Ackerman, 1964). Some of these lesions have been also called Brunner's adenoma (Frantz, 1959), a term better reserved for the rare solid neoplasm of Brunner's glands. In the pyloric region, the most common ectopia is the one of pancreatic tissues (Palmer, 1951; Marshall, 1955; Martinez, Morlock, Dockerty, Waugh, and Weber, 1958; Hudson and Richardson, 1959). We describe the case of M. G. A 65-year-old man from Ferrara presenting a history of epigastric pain and occasional vomiting with radiographic findings of a gut mass. A physical examination was unremarkable. Appendectomy, resection of gastric fistula. The patient was on therapy with PPI. Radiography with Gastrografin revealed the presence of cystic mass (diameter of 6 cm), which deforms and displaces the pylorus. Blood tests were normal. An upper gastrointestinal ecoendoscopy confirmed the presence of a well-defined, oval gut mass in his upper abdomen, compressing his duodenum. The mass had a mixed density and was considered to probably be a gastrointestinal stromal tumor (GIST) [Figure 1]. Under general anesthesia in the reverse Trendelenburg position with the legs apart, four trocars were inserted. Inspection of abdominal viscera demonstrated no metastasis and an important adhesion syndrome. There was a tumoral protrusion at the antral serosa. Adhesiolysis was done. After left liver elevation, the gastrectomy was started with the mobilization of the greater curvature along the transverse colon by harmonic scalpel. Left gastric vessels were identified after opening the bursa omentalis. The greater curvature was mobilized till to splenic hilum for complete omentectomy. After cutting just after the pylorus by endoscopic stapler, the roots of left gastric vessels were exposed and left gastric vein was divided. The left gastric artery was divided near to its root after double clips. The dissection was moved to esophagocardiac junction at lesser curvature and these lymph nodes were included to the resection specimen. The stomach was divided with endoscopic stapler in a transverse plane 10 cm below to esophagogastric junction. Extraction was done by Endobag through umbilical port site. A transmesocolic Roux-en-Y reconstruction was performed by laparoscopic linear stapler, and common hole of the stapling legs was closed with V-lock suture intracorporeally. Side-to-side jejunojejunostomy was fashioned by endoscopic stapler again, and the common hole was closed intracorporeally as well. Macroscopic examination revealed a lesion in the antrum extending 6 cm along its longitudinal axis. The cut surface was grayish-white and lobulated [Figure 2]. 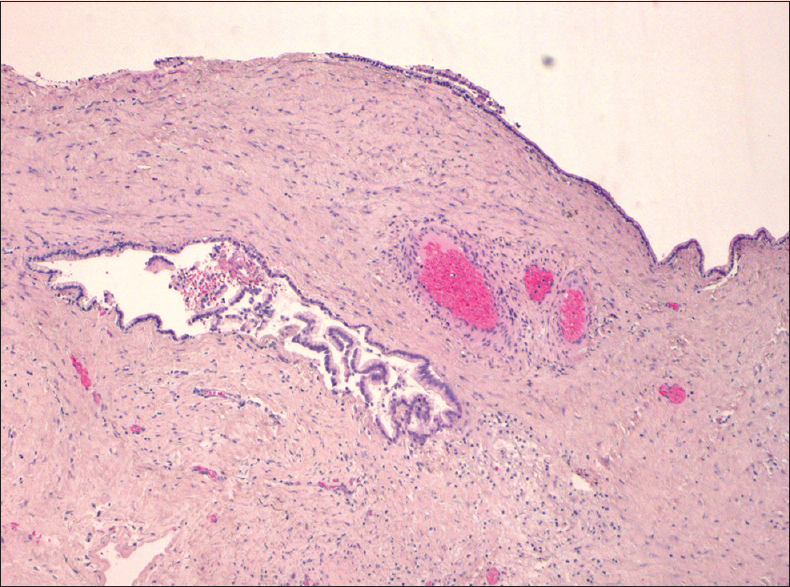 On histology, the lesion showed features of a hamartomatous polyp. The lesion was composed of two proliferations, one composed of dilated pancreatic-type ducts surrounded by smooth muscle bands, interspersed with mucous secreting glands and Brunner's glands. This composition resembled a myoepithelial hamartoma. Histopathological examination revealed a myoepithelial hamartoma. These tumors are characterized by hypertrophic smooth muscle bands surrounding varied epithelial elements, which may be arranged in different patterns such as simple glandular structure, Brunner's gland, pancreatic ducts, and sometimes pancreatic acini. These hamartomas often may appear as a round- or oval-shaped mass in the submucosal tissue [Figure 3] and [Figure 4]. Postoperative period was complicated by the presence of an intra-abdominal bleeding for which was performed computed tomography abdomen and repeated ultrasound scans with drainage of the collection. The postoperative hospital stay was 10 days and was complicated by episode of anemia that required blood transfusions. Subsequent postoperative days were conducted regularly in the absence of complications. The patient was discharged with personalized diet after specialist assessment. Our patient was followed up at two months and six months after discharge with a complete physical examination and had no recurrence of symptoms. Our case simulated a GIST, presenting as an oval-shaped mass in his upper abdomen, compressing his duodenum. This report is complemented by a literature review relating to the atypical presentation. 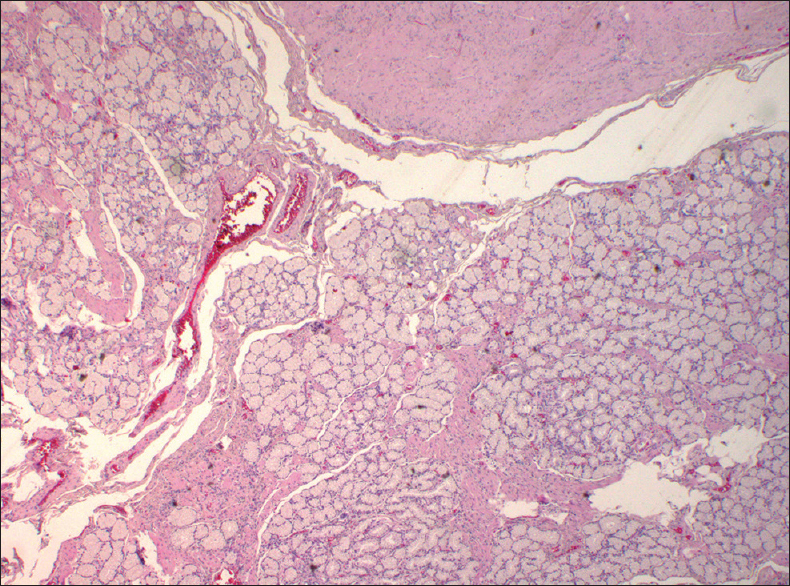 Myoepithelial hamartoma may present with nests of pancreatic tissue dispersed in the smooth muscle bands. In general, these lesions are considered to be either a form of hamartoma or a pancreatic heterotopia. Only lesions where pancreatic tissue is normally arranged are defined as “ectopic pancreas” in the literature. 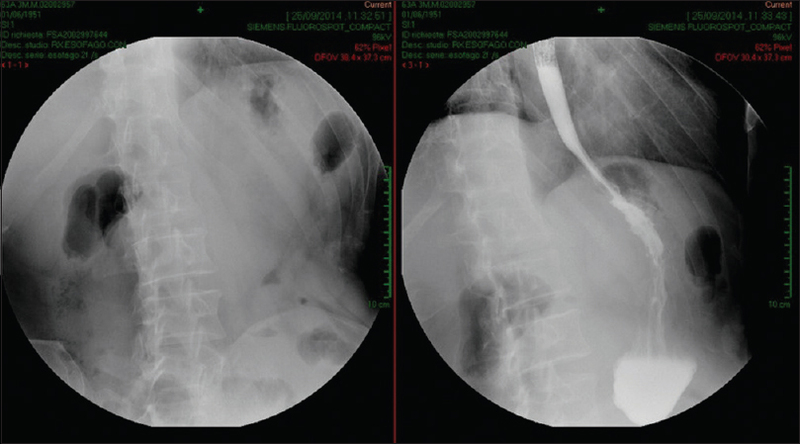 some outwork suggested that these lesions would be Barium meal follow-through showing a smooth filling defect, deformed bulb, and partial narrowing of the duodenum considered a form of hamartoma based on their observation. Among the cases reported in the literature, most of the tumors were diagnosed using conventional X-rays in the upper gastrointestinal tract using a barium meal follow-through; others were detected accidentally during surgery or autopsy. Forty cases have been reported in the literature not including ours [Table 2]. In these cases, the patients' age ranged from 8 weeks to 81 years and in almost two-thirds of them, the lesion was detected between the fourth and sixth decades of life. The distinctive histological feature of this tumor was the presence of hypertrophic smooth muscle bands that surround the epithelial elements, arranged in various patterns including simple glandular, Brunner's gland, and pancreatic acini. Ectopic pancreatic tissue nests were reported in one-third of the cases, and they have been recorded in the gastric antrum and the pylorus for 85%–15% of the cases, respectively. Gastrointestinal tract adenomyomas are generally considered to be benign and may present clinically with in part long-standing, but unspecific symptoms, such as pain, nausea, anorexia, and in some patients, they can cause intermittent pyloric obstruction. However, specific problems have been described, such as obstruction, bleeding, perforation, biliary fistula, and heterotopic pancreatitis with resulting pseudocyst. The diagnosis had not been suspected before postoperative or postmortem histological findings, even in the cases where an esophagogastroduodenoscopy was performed. Most of the cases reported in the literature were diagnosed by conventional X-rays of the upper digestive tract using a barium meal, while the others were detected accidentally during surgery or autopsy. Since these tumors may have the shape of a submucosal mass with central pancreatic heterotopia, endoscopy does not permit a differential diagnosis between hamartoma and leiomyoma, melanoma, lymphoma, carcinoid tumor, Kaposi's sarcoma, or eosinophilic granuloma. Hamartomas often appear as a round- or oval-shaped mass in the submucosal tissue simulating a lipoma, a neurofibroma, or a polypoid formation. Vandelli et al. had attempted to treat an antral lesion unsuccessfully and confirmed the difficulty of preoperative diagnosis. These observations corroborate the recommendation made by Hedenbro et al. for surgery and resection in all cases of suspected gastric lesions to ensure a correct diagnosis. Radical surgery is justified in cases of a definite diagnosis of hamartoma as the lesion is very rare and may not be benign, and the risk of cancerization is still an open question. In case of an adenomyoma of the periampullary region, surgical limited resection is recommended; however, pancreaticoduodenectomy is often performed as the lesion is frequently misdiagnosed as a carcinoma. Whenever possible, perioperative frozen section diagnosis should be used to prevent unnecessary radical surgery. 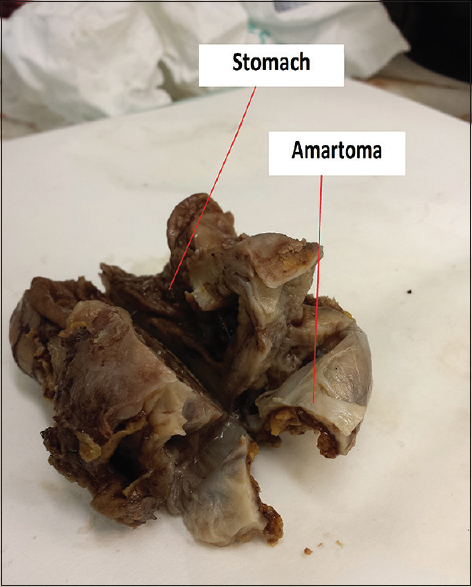 Sporadic cases of gastric hamartomas associated with malignant tumors have been reported in the literature, but in these cases, the neoplasia was identified before the hamartoma. Although the relationship between the two pathologies is still not clear, the possibility of malignant degeneration cannot be completely ruled out. The authoritative opinion is that a hamartoma should always be treated surgically, to avoid possible malignant degeneration or, in rare instances, intestinal obstruction. The complete removal of the hamartoma can give full removal remission of symptoms. Clinically, it is difficult to differentiate the lesions caused by the hamartoma from the ones proper of carcinoma. When they occur in the Vaterian system, often leading to an unnecessary pancreaticoduodenectomy. In our case, the magnification of images that laparoscopic surgery ensures did not allow to establish the nature of the tumor based on its macroscopic characteristics. Laparoscopic surgery still represents a valid proposition in case of removal of myoepithelial hamartomas, taking into account, the substantial benign evolution of the disease and the benefits of this surgery: A reduced hospitalization time, lower postoperative discomfort, and the best esthetic result. Gut masses need to be investigated thoroughly, and the possibility of rare tumors should not be excluded. Although the recommended treatment for such lesions is the limited resection, radical procedure such as a pancreaticoduodenectomy is often performed when the lesion occurs in the periampullary area because of a preoperative misdiagnosis as a carcinoma. Therefore, it is essential for clinicians to maintain current knowledge of the lesion to avoid inaccurate diagnosis and prevent unnecessary surgery. Laparoscopic surgery has proved to be an effective approach to the treatment of gastric lesions, and in our case, has guaranteed the radical surgery confirming the inherent advantages of a minimal invasive surgical technique. The intervention is safe and relatively easy to execute if performed by surgeons with adequate laparoscopic experience. Nabi J, Authoy FN, Quamrul Akhter SM. Atypical presentation of myoepithelial hamartoma in the antrum of the stomach, mimicking a gastrointestinal stromal tumor: A case report. J Med Case Rep 2012;6:382. Lasser A, Koufman WB. Adenomyoma of the stomach. Am J Dig Dis 1977;22:965-9. Ly DP, Barnard NJ, Schwarz RE. Gastric adenomyoma: Definitely benign or defiantly premalignant? Dig Dis Sci 2004;49:1930-4. Janota' I, Smith PG. Adenomyoma in the pylorus. From the Department of Pathology. London: Royal Free Hospital; 1966. Magnus-Alsleben E. Adenomyome des pylorus. Virchows Arch (Path Anat) 1903;173:137-56. Portale TR, Mosca F, Vicari S, Pulvirenti G, Fichera S, Salomone E, et al. Myoepithelial hamartoma of the stomach simulating a gastric carcinoma. A case report. Tumori 2007;93:220-2. Zarling EJ. Gastric adenomyoma with coincidental pancreatic rest: A case report. Gastrointest Endosc 1981;27:175-7. Chapple CR, Muller S, Newman J. Gastric adenocarcinoma associated with adenomyoma of the stomach. Postgrad Med J 1988;64:801-3. Hedenbro JL, Ekelund M, Wetterberg P. Endoscopic diagnosis of submucosal gastric lesions. The results after routine endoscopy. Surg Endosc 1991;5:20-3. Kayahara M, Ohta T, Kitagawa H, Miwa K, Urabe T, Murata T. Adenomyomatosis of the papilla of Vater: A case illustrating diagnostic difficulties. Dig Surg 2001;18:139-42. Ling Ch, Situ Zx. Gastric adenomyioma: With report of 9 cases. Zhongua Wai Ke Za Zhi 1985;23:424-5,446. Ryan A, Lafnitzegger JR, Lin DH, Jakate S, Staren ED. Myoepithelial Hamartoma of the Duodenal Wall. Virchows Arch. 1998;432:191-4.